class="post-template-default single single-post postid-377894 single-format-standard group-blog masthead-fixed full-width singular wpb-js-composer js-comp-ver-5.7 vc_responsive"
Peterson, D-Minn., met Tuesday with members of the North American Agricultural Journalists and spoke about several topics. On disaster aid, Peterson said inserting Midwest aid into a current disaster bill in the Senate could potentially hold up needed aid for Southern farmers whose farms were hit hard by hurricanes last year. Now, the Midwest flooding has come into play. “That’s getting tangled up with this because people are playing politics with it and making it sound like the government’s got to come in with a big disaster deal and save people,” Peterson said. The states of Nebraska, South Dakota, Iowa and Missouri were hit by a powerful storm in mid-March that caused rapid flooding of several rivers that are tributaries to the Missouri River. Dozens of communities were flooded in those states, causing extensive damage to roads, bridges and levees. Both livestock and grain farmers suffered major financial losses. Now a similar storm, dubbed “bomb cyclones,” is expected to again develop in the Rockies and turn into a blizzard and heavy rains across Plains states and the Midwest. The storm will bring snow, rain and high winds across several states. Beyond hitting those areas already hit by floods, the latest cycle of storms will likely further delay fieldwork and spring planting. Midwest lawmakers have pushed to include disaster aid for floods into legislation in the U.S. Senate. For farmers hit by those storms and floods, Peterson said the 2018 farm bill deals with most of their needs already. The congressman did note that farmers who lost crops in grain bins should be eligible for an indemnity payment and Congress should work to make that happen. 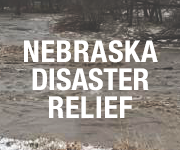 Nebraska and Iowa officials have pegged disaster losses from infrastructure and agriculture at around $1.5 billion in each state. Missouri officials have not detailed the total losses. Peterson added that farmers who lost grain in bins likely could have bought a property and casualty insurance policy for stored grain, though he noted it would likely have been expensive to purchase. Farmers who lost crops have repeatedly also expressed worry that they will have to rely on prevented planting insurance on their fields, and prevented planting indemnities may only cover a small portion of their lost income from 2019. Bill Northey, USDA’s undersecretary for farm production and conservation, told reporters Monday that Congress is looking at a disaster bill to allow some coverage for those grain losses, though it’s unclear just how that disaster coverage will look. “We don’t have anything in our programs now,” Northey said. In the South, Peterson said, hurricanes hit right before the pecan harvest, and there are farmers who lost 70% to 80% of their trees. Those farmers will take years to reestablish their orchards, he said. Peterson suggested Congress should finish legislation with Southern disaster aid separately, then work on a program for stored grain losses in the Midwest. In the Red River Valley, where Peterson noted there is often flooding, he got the Natural Resources Conservation Service director in 2009 to fund ring dikes around farms in the valley. 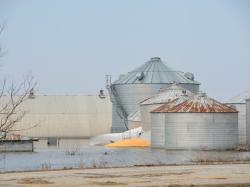 “So we don’t flood anymore and the grain bins are protected, along with the house,” Peterson said. It’s common that anytime there is a disaster bill, another disaster strikes, said Senate Agriculture Committee Chairman Pat Roberts, R-Kan.
“Anytime you do a disaster program and you try to address the problems of each state or each crop or each region, then you have another disaster or area that has been affected, as well, and there are hard feelings in terms of ‘Wait a minute, we’re not being covered by that bill,'” Roberts said. Before the Midwest floods hit, the disaster package moving through Congress primarily was meant to help farmers and businesses in Georgia, Florida, Texas and Puerto Rico that were hit by hurricanes, as well as funding for recovery from wildfires in California. The disaster package got held up in the Senate because Democrats still want more aid for Puerto Rico and Senate Republicans are resisting that funding. The Army Corps of Engineers is holding meetings this week about flood risks in major communities along the Missouri River, including meetings in Fort Pierre, South Dakota; and Sioux City, Iowa; on Wednesday, as well as Smithville, Missouri; and Nebraska City, Nebraska, on Thursday. For more information about the meetings, visit http://www.nwd-mr.usace.army.mil/…. State officials have said they want more control over flood protection along the Missouri River. 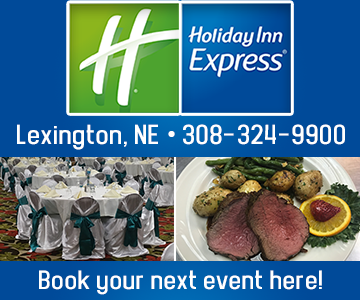 The United States Senate Committee on Environment and Public Works is planning to hold a field hearing from 9-11 a.m. Wednesday, April 17, in Glenwood, Iowa. The hearing will focus on Missouri River management and the current flooding situation in Iowa, Missouri and Nebraska.